Fats and oils are fascinating materials since they can be considered an orthodox polycrystalline material, a colloidal crystal, or a colloidal oleogel, or all of them simultaneously. The physical and functional properties of fats are influenced by the amount of crystalline material present, the size and shape of crystals, polycrystals and aggregates, inter-colloidal forces, as well as the spatial distribution of network mass. 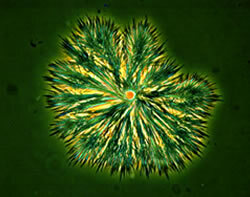 The main areas of research endeavor here include a) Nucleation and crystal growth, b) Crystal aggregation into supramolecular assemblies, c) Structural-mechanical network models, d) Inter-crystalline and crystal-oil interactions. A recent review in the journal Soft Matter from the Royal Society of Chemistry summarizes much of our work in this area. Fats and oils are composed of triacylglycerols (TAGs), which crystallize from the melt to form primary nanoplatelets which eventually aggregate and grow into colloidal particles or mesocrystals. From 2008 to 2012, we imaged and characterized the nanoscale in fats, providing a significant advance in our understanding of the structure of these materials. 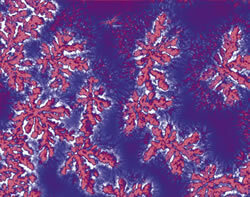 The primary colloidal crystals continue aggregating until larger clusters or flocs are formed. These eventually form a space-filling network, with significant amounts of liquid oil trapped within. 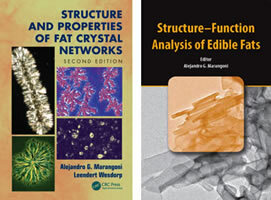 In 2012, we published two new books in this fundamental area, Structure-Function Analysis of Edible Fats (AOCS Press) and Structure and Properties of Fat Crystal Networks (CRC Press). Both the analytical techniques necessary to study structure-function relationships in fats and the theory behind them are described fully. Each book also includes a practical chapter on "how-to".